Perhaps the biggest “wow” of this year came in early October when we spent ten days in Cape Town, South Africa. We always expect to enjoy the places we travel to, because after all, we chose to travel there! But this was a case of a country (and city) that totally blew us away with its beauty. Sticking with the Kimble theme of ultrarunning, we were initially drawn to Cape Town because of a trail mountain race taking place there. The race was in its second year, and the course took runners up and over Table Mountain, one of the new wonders of the world! We couldn’t say no to it, so I signed up for the 100k and Karen decided to take on the 20k. The weather for the race was predicted to be nearly perfect. Unfortunately (but ultimately better for our memories), it didn’t turn out that way! There was a mist spraying down on the runners as the 100k/50k race began at 5am, which quickly turned into hard rain as we ascended into the mountains. In addition to the rain, the wind was blowing quite hard because there was nothing to shield us 3,500 feet above sea level on a flat mountaintop. In one word, the weather was epic. These are the conditions that make a race tough while it’s happening, and totally memorable after the fact. Part of the single track course through a wooded area. Karen with her head in the clouds! 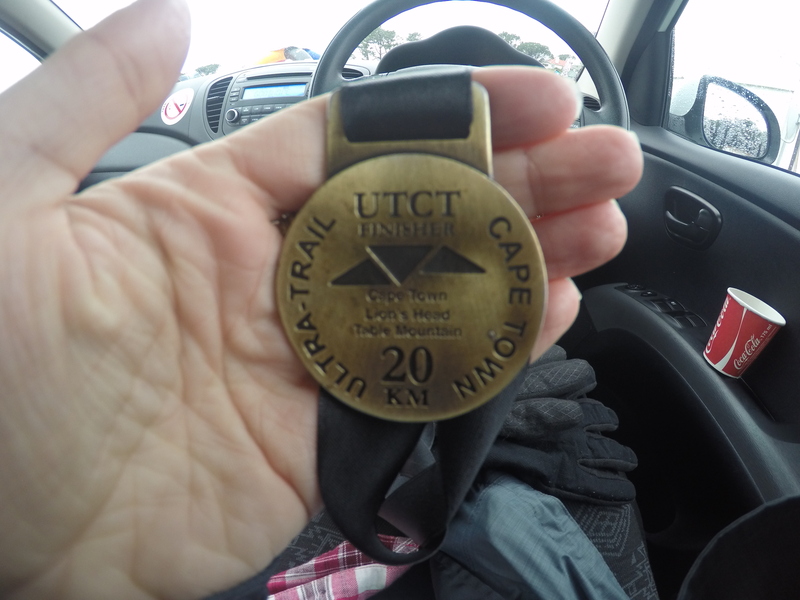 Vertical running is no joke- I’ve run in races with a greater overall elevation gain than the UTCT, but what made this course difficult was the degree of the vertical grade. Much of this race involved power-hiking up single-track trails that were much like very steep stairs. Fog is the master of disguise- unfortunately for the runners, the rain and fog on top of Table Mountain prevented us from seeing the best view in all of Cape Town. On the other hand, we still saw some stellar views later in the race after the weather cleared up! Ultrarunning is a team effort- from pushing other athletes to run harder to helping push them up and over giant boulders, I continue to gain respect for this community for the incredible camaraderie shared by all. Mountain ultra trail races allow you to reach the beyond- you will see and explore places that you literally could not get to any other way! The ultra community continues to amaze us- from the friendly volunteers and spectators to a everybody-knows-everybody group of people who are all connected in one way or another, we can’t get enough. Even in South Africa we came across many people that we will undoubtedly see again. Crossing the finish line of the 100k! Check out our YouTube video of the time we spent up in the mountains in one of the most beautiful places we’ve ever seen! I love the penguins!! How cool (and weird to see penguins without snow around them). Enjoy the end of your RTW as it comes to a close and cherish all of these awesome memories! And as soon as you get back start saving for your next RTW, because, why not? Right? They were such cool creatures. And the whales were amazing, too! Thanks for the well wishes, Lisa! And we agree…almost time to start saving again! why do all of your videos make me want to cry?? everything is so beautiful. 😉 Can’t believe we’re going to see you in a few weeks!! !